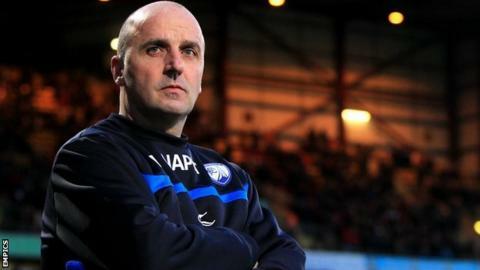 Chesterfield have refused Portsmouth permission to speak to their manager Paul Cook, reports BBC Radio Sheffield. Pompey's previous boss Andy Awford stepped down earlier this month but the timing of their approach has angered Spireites chief executive Chris Turner. "It's very disturbing at this time of the season - we've got a big game on Saturday," said Turner. "We do not want Paul to leave, we want him to stay." Cook has been in charge of Chesterfield since October 2012. He guided them to last season's League Two title and their good form has continued in this campaign with a play-off place in League One all but assured. Turner told BBC Radio Sheffield: "We're in the greatest position Chesterfield have been in in 30-odd years and it's very annoying - but it's football and they've asked for permission and we've refused it and as far as I'm concerned it's the end of it. "I've informed Paul of the situation. He's done a great job for us and I'm not surprised that clubs will be interested in him but the timing of it is questionable. "Paul is 100% committed to the cause and we'll make sure it doesn't interfere with anything to do with our next two matches." Portsmouth are in their second season in League Two, having been relegated from the Premier League in 2010.